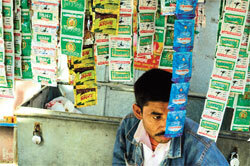 The government of India has banned the sale of gutkha and other chewing tobacco products across the country. The Food Safety and Standards Authority of India (FSSAI) issued new regulations on August 1, prohibiting the use of tobacco and nicotine in any edible product. Health experts and civil society groups have cautiously welcomed the ban. After all, the gutkha industry has circumvented several such ban orders issued by states and the Centre earlier. In the early 2000s, Goa, Andhra Pradesh, Maharashtra and Tamil Nadu banned chewing tobacco. The industry challenged it in the Supreme Court, which said only the Centre can impose such a ban. In 2006, the Centre proposed a similar ban across the country by amending the Prevention of Food Adulteration (PFA) Act of 1954, then in force. The gutkha industry again contested it in various state high courts and obtained stay orders. The petitions against the amendment were transferred to the Supreme Court in 2009. But the government never pursued the case and the proposed ban did not see the light of the day. The case now has little significance with the Food Safety and Standards Regulations of 2011 replacing PFA Act. “If one takes previous instances into account there is a good chance the gutkha industry would challenge the ban this time as well,” says Dharamveer Katewa of the Indian Asthma Care Society, a non-profit in Rajasthan. The industry (estimated to be worth Rs 50,000 crore) has a powerful lobby, he adds. The non-profit has been fighting against smokeless tobacco for two decades now. Katewa and several other activists now pin their hope on the debate on the health hazards of smokeless tobacco being heard by the apex court. “If the apex court bans it, there will be no going back for the industry,” says Katewa. The genesis of this debate can be traced to a case filed by the Indian Asthma Care Society in the Rajasthan High Court in 2003 against the pollution caused by the plastic sachets used in packaging products like gutkha and pan masala. The court in 2007 prohibited all gutkha manufacturers in the state from using plastic packaging. The industry challenged the ruling in the apex court, which in Dec ember last year upheld the high court’s ruling and directed the Centre to ensure that gutkha and paan masala are not sold in plastic pouches (see ‘Partial ban’, Down To Earth, March 1-15, 2011). Taking suo moto initiative, the judges asked the Centre to conduct a comprehensive study of the ingredients of gutkha and similar products manufactured in the country and their harmful effects on human health. The Centre submitted its report in February. 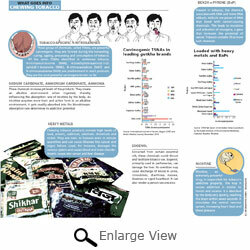 All major Indian brands of smokeless tobacco products contain around 3,095 chemicals, the report said. These include cancer-causing chemicals like Tobacco-Specific N-Nitrosamines, or TSNAs, and heavy metals like lead and copper (see infographics). Lead is a poisonous metal that can damage the nervous system, while copper can tweak genes. There is no safe limit for most TSNAs, the report says. The National Institute of Health and Family Welfare (NIHFW) prepared it by compiling lab tests in India and abroad between 2003 and 2010. One such lab test by the Indian Institute of Environmental Medicine at Kasturba Hospital in Mumbai in 2009 found 30 per cent of the tested gutkha brands exceeded the permissible limits of heavy metals fixed by the World Health Organization (WHO). High levels of heavy metals were also found in gutkha during a test in the lab in 2004 (see ‘Loaded with heavy metals and BaPs’). Shockingly, the lab tests show red tooth powder has nicotine and a few carcinogens and heavy metals, though it is not branded as a tobacco product. The NIHFW report shows the risk of cancer of the mouth, throat, oesophagus and pancreas increases with increased consumption of smokeless tobacco and frequency of its use. There is a strong evidence of betel nut causing cancer of the oral cavity, oesophagus and liver. Their consumption can affect reproductive health and trigger hypertension and heart diseases, the report says. Apart from lab studies, the report includes opinion letters from the directors of various Regional Cancer Centres of the country, who on the basis of their research, have recommended prohibition of chewing tobacco. Manufacturers of smokeless tobacco products, however, pick apart the NIHFW report, saying it is biased and illogical. “Cancer is caused by multiple factors. The report seems to be saying that smokeless tobacco products are the biggest cause of cancer without considering reasons like smoking, drinking and malnutrition,” says Sanjay Pathak, lawyer representing D S Group, the manufacturer of Rajnigandha Pan Masala. Besides, the committee that prepared the report did not conduct any test of its own, he adds. The court will hear views of the civil society groups, government and industry on the NIHFW report on August 25. Government’s fancy for gutkha Even if the Supreme Court bans it, the fact that bewilders many is what took the government so long to ban smokeless tobacco. Even a law to regulate its use—Cigarettes and Other Tobacco Products Act (COTPA)—came into force only in 2003, whereas the use of gutkha and pan masala was growing at a fast pace in the early 1990s because of their cheap availability in 50-paise and onerupee pouches. The government does not even seem to be acknowledging the new rules banning smokeless tobacco products. When asked, soon after the regulations came into force on August 5, a highly placed officials with the Union health ministry feigned ignorance, saying the rules were notified by the environment ministry. When confronted with the fact that the notification has been issued on behalf of his ministry, he said FSSAI issued it without consulting the ministry. “It (FSSAI) is an autonomous body. It can issue notifications on its own.” Defending the ministry’s stand, the officials added that a ban on smokeless tobacco products is not feasible because the industry employs a large number of people and a large number are addicted to these products. Moreover, COTPA, which regulates tobacco products, does not have a provision for complete ban. “It talks about just regulations and we are guided by it,” the officials said. Imposing more regulations, restrictions and awareness campaigns is the right way to reduce chewing tobacco consumption, he adds. Monica Arora of Public Health Foundation of India dismisses the suggestions of the health ministry official. “Campaigns, regulations and restrictions have been going on for long. None of that could control the menace of chewing tobacco. We discussed all this in the national consultation (convened by the health ministry and WHO in April). A ban is the only solution,” she says. Over 80 tobacco control experts, including Arora, from across the country and select international experts had participated in the consultation. It had recommended the government develop a comprehensive plan to deal with the social and economical implications of a total ban on smokeless tobacco, including tobacco cessation, loss of revenue and livelihood, and illicit trade. The Union health ministry has shied away from banning smokeless tobacco in the past as well. In fact, COTPA came into being because of a petition by the Indian Asthma Care Society seeking a ban on tobacco in Rajasthan in the state high court in 1994. The court asked the director General of Health Services (DGHS) of the Government of India, to submit a report on the health impact of chewing tobacco. Based on DGHS report, the Central Committee on Food Standards in 1997 recommended a ban on chewing tobacco. The health ministry, however, did not accept the recommendation. At an inter-ministerial meeting, it said the ban was not feasible. Rather, it decided to regulate the sale and advertisement of tobacco products and framed COTPA. “The government lacks political will to take a strong decision against the gutkha industry,” says Katewa. Bhavna Mukhopadhyay of Voluntary Health Association of India, a non-profit in Delhi, says the attitude of the government towards smokeless tobacco products has been callous. The gutkha and pan masala industry is so secretive that nobody knows what goes into manufacturing them. There are theories that waste from perfumeries and tanneries are used in these products, which make them more toxic. But the government has no qualified lab to ascertain this, Mukhopadhyay adds. The NIHFW report also highlights the need for comprehensive lab tests by the government on the Indian smokeless tobacco products. In January, while preparing the report on health impacts of smokeless tobacco products for the Supreme Court, the health ministry asked the Central Tobacco Research Institute at Rajahmundry in Andhra Pradesh to conduct tests on gutkha. In its reply, the institute said it had equipment to test only certain components of it, such as nicotine, pH values and TSNAs. While it has finished tests for nicotine and pH, the results for the TSNA’s are awaited. But the ministry has kept the test reports a secret. In fact, it shared NIHFW report with the other parties to the debate on health hazards of gutkha only after the Supreme Court asked it to do so. So, what next..!! Will MOHFW act now..? I suppose unless Supreme court orders MOHFW to notify, it won't. I consider we will have to revert back to SC for the proposed notification.